Last week, Swedish pianist Martin Sturfält introduced Absolute Classics’ audiences to a style of thematic programming as individual as the musician himself. 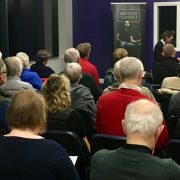 Performing four concerts of over four days across the region beginning with an evening concert at Annan Academy, Martin’s first programme gave a fascinating incite into the way in which composers throughout history have taken direct inspiration from J.S.Bach. Eloquently he framed each work, giving historical reference of their relation to the great composer and cleverly managing to include works by the Scandinavian composers Sjögren and Nielsen, all in an accessible and enjoyable format. With intellect and precision, Martin’s second programme of the week spoke to those who yearned for something more familiar. The music of Schubert and Chopin filled the air with graceful swathes of harmonious resonance. A true feast for the soul. Join us next month for the 3rd instalment of the Absolute Classics season. The internationally renowned Fournier Trio will perform a selection of well known works, including pieces by Beethoven, Brahms, and the famous ‘Dumky’ trio by Dvořák. The Trio will begin their regional tour at Annan Academy on the evening of Thursday 15th November.